Here we are at The House That Stamps Built, starting off the new month with a Designer's Choice Challenge. This week it's Patti J's turn. 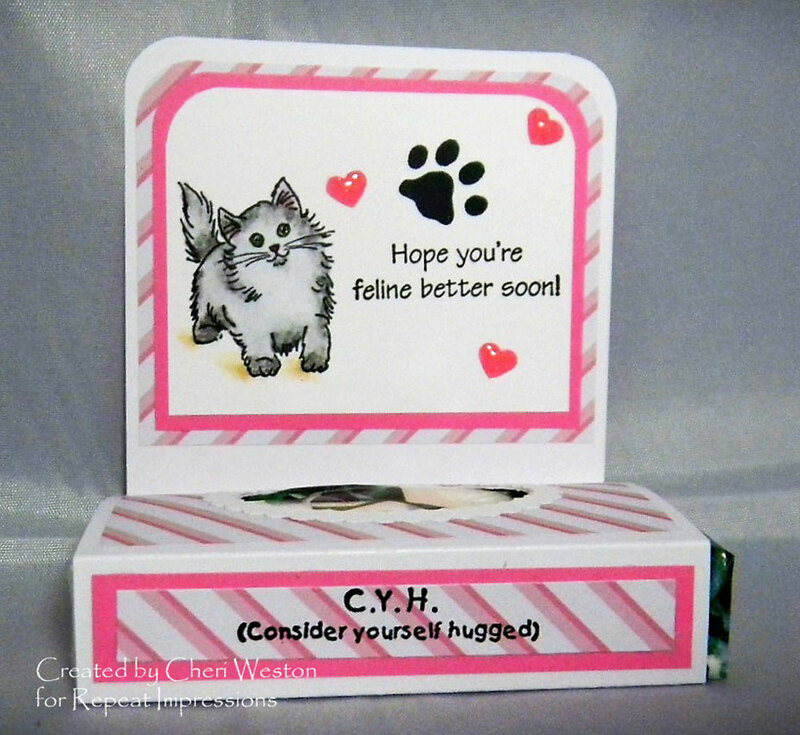 Patti challenged us to create "anything but a card". My project is a tissue holder. It's deep winter here in Maine and that means cold and flu season takes over. As I was making this, I smiled the entire time. That little kitten gives me such a giggle, and if you've ever had one, you know how snuggling them makes you feel so much better. 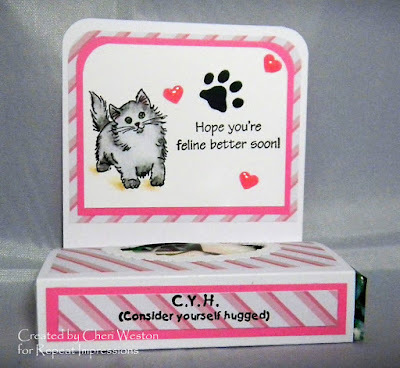 I used four awesome Repeat Impression stamps on this little cutie; RI#412-G "C.Y.H" , RI#8204-H "Kitten", RI#4033-F "Feline Better" and RI#2608-C "Cat Paw. All the details on how to join the challenge are at The House. Let's see what you can come up with for Patti's, Anything But a Card, challenge. Let's have some fun! You are going to be blown away by my team mates and what they've come up with for this challenge. Check them out. Thanks so much for stopping by and I hope you'll leave me a comment and let me know you were here. Perfect for this Designer Choice - and love the images you choose. We went through more than several box of tissue the last 3 weeks. This "crud" just seems to hang on. And seems like tissue boxes get smaller and the price goes up. Great project. This is just a wonderful project for out DCC! Saving to make one later! Thanks for the inspiration. What a fabulous project, and such a great choice of images. This is so useful too! What a cute kleenex holder! I love it - perfect sweet gift for someone who has those sneezies! Cheri, this is adorable! You gals have knocked this challenge out of the park! Great job!! !